Social media, (this blog is no exception), tends to highlight the beautiful and shiny part of our existence. Today I’ve decided to show you another side of my journey as an athlete, one made of struggles and challenges. I’ve been through a lot this year, I feel stronger and better than ever, I hope to be able to share some of this strength with all of you. A: I started a new job in September, it took up a lot of my time, I couldn’t train as planned. B: I still have some usable vision (light perception), it helps me a lot in my daily life. Over the past few months, my sight kept deteriorating, I bumped into many new obstacles, but I was in denial. C: Since my divorce in 2017, I’ve been missing my family back in France more than usual. I felt terrible for weeks after this race, not just because of the disappointing finish, but because of everything else around it. Triathlon is for me a little window, a dream that I’ve been pursuing for years, an endless source of happiness and pride. But after this race, I felt as if I had lost this as well. So what did I change? A: I had a conversation with my new boss, told her what my goals were, she was very supportive. B: I talked about my vision loss to the people around me, it was as if a huge burden came off my back. C: I booked flights to France for Christmas, I often forget how difficult it can be to be an emigrant. I can’t wait to catch up with my parents and my brothers. They are a big reason why I do everything I do. D: I reminded myself that I don’t race to be the best, but to be the best possible version of myself. E: I talked to Thomas, we learned a lot about each other, I’m convinced that we won’t make the same mistake next time something like this happens. I don’t know if all of this will be enough, but I already feel a lot better. I’ve always had a stoic approach to change, although I can’t control what happens to me, I can control my attitude toward this change, to a degree. Pain is a great motivator, I’ll never forget how I felt on that bike. I think about it at every workout, I remind myself that at each race, you either win or learn. We all have an inner dialogue, a little voice that sometimes tells us that we are not good enough, that we don’t belong. It was very tempting to listen to this voice, to quit, but instead I took a little break and quieted this negative influence. It will take a lot more than this to make me quit. I love this sport more than I even imagined! There are many people who are great to be around when times are easy, new York City is a fascinating place. But I have just a few friends who are willing to sacrifice their time and the resources they have in their life to help improve mine. Those are my real friends. I am so grateful to know all of these people who are ready to wake up at 5:30 am to swim with me in the winter, who are ready to leave their family on a beautiful Saturday to go on a 4 hour bike ride. They are the main reason why I keep doing what I do. I hope that all of this was helpful, we are all on a difficult journey. 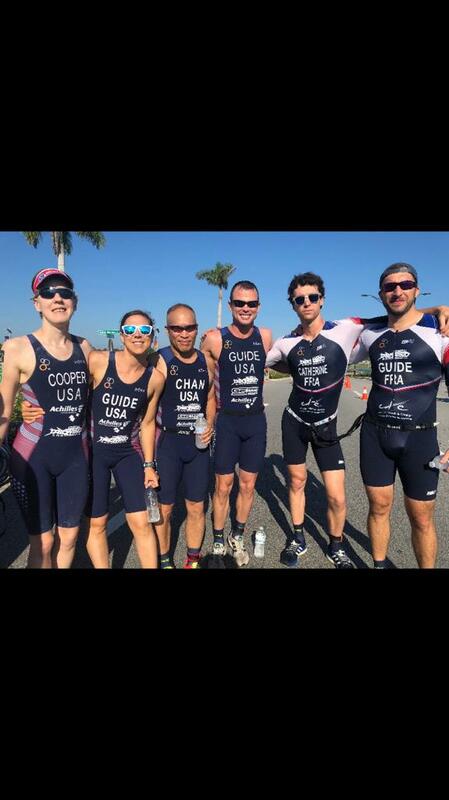 The picture that I chose to illustrate this article is a picture of the six Tri Achilles athletes who did that race in Florida right before the start. They are all great friends of mine, just like me, they are all amateurs who love our sport and our community. We had no idea how this race would go, but we knew one thing, once the race was over, we would all be there for each other. Go Tri Achilles! Well said having a family of friends to support training is a must to succeed. See you next season Dave Tilly. Team Para triathlon Ireland.